A compromise was reached yesterday (June 29th, 1787) in Philadelphia combining the New Jersey Plan and the Virginia Plan. This has been a major conflict for quite a while. The New Jersey Plan was debated for four days, but the larger states rejected it. The Virginia Plan was debated for two weeks. Many believe that the compromise that has been reached is a major progression towards the unification of the States under a Federal System and has solved the problem of state representation. When it appeared that the Constitutional Convention would break up the delegates began to make compromises on important issues. The first thing that they resolved was the problem of State Representation. The smaller states were in favor of The New Jersey Plan, which was proposed by William Paterson. In many ways this plan resembled our current plan of government, The Articles of Confederation. This plan proposed a one-house national legislature with representatives selected by state legislatures. Each state will be able to cast one vote. It also proposed a supreme court appointed for life by the executive officers. The Larger states support the Virginia Plan. The Virginia Plan was proposed by Edmund Randolph. The plan favored the interest of the larger states, the smaller states feared that they would have no power. This plan proposed three separate branches of government and a bicameral legislature where representation will be based upon states population or money contributions. The Compromise was submitted to the constitutional convention to break the deadlock created by the New Jersey Plan and The Virginia Plan. The convention decided, after months of debate, that the legislature will be bicameral, meaning there will be two houses, one house will have equal representation, while the other is based on population of the state. After further argument, the delegates agreed to what is really a great compromise also known as The Connecticut Compromise. It is known as The Connecticut Compromise because Roger Sherman who has a large part in this compromise is from Connecticut. Members in The House of Representatives or the lower house will be appointed among the states according to population and they will be elected by the people. In the upper house or the Senate, all states will have an equal number of representatives, which will be chosen by the state legislatures. The House has the power to originate all bills for raising or spending money. The Senate favors the smaller states. Now with two senators each, every state has equal representation. This Compromise was proposed by Roger Sherman. If you would like to know more about the man who may have saved the states, read on, to see his Biography. Roger Sherman is a very important man. This leader from New England was born in 1721 with humble origins. While on the farm he worked as a shoemaker and cobbler. In 1743 he moved to New Milford, Connecticut. Here he was employed as a surveyor, storekeeper, almanac compiler and lawyer. He received an honorary masters degree in 1768. Sherman opposed the Stamp Act and supported the Sons of Liberty. He signed the Declaration of Independence and the Articles of Confederation. 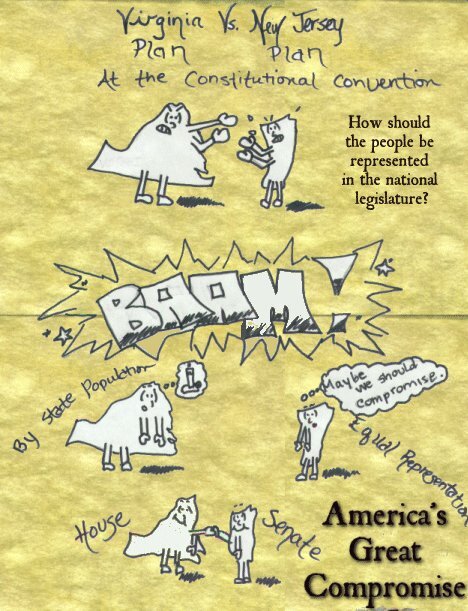 Roger went to the Constitutional Convention to help devise what today's main story was about, "The Great Compromise." Personally, I believed strongly in the Virginia Plan. I feel that Randolph's Plan was the most adequate. I feel this way because representation by population gives the people in general equal representation, also feel that it will meet our countries needs more fully than the New Jersey Plan. However, I am very pleased with the compromise that was reached. Having two houses, one with equal representation and the other with representation according to population is a wonderful compromise of the two different plans. It has combined the stronger points from both of the plans to make a compromise that I feel is a large and important step in the future of the states. Here's a quiz on the Great Compromise! Here's another one to test your political skills! Earn an online university degree. Are you worried about testking cissp exam besides exam pass4sure cissp study guide preparation? We offer up-to-date exam testking 1Y0-A24 certification dumps and pass4sure mcsa exams paper with 100% exam pass guarantee of pass4sure cissp certification papers dumps.